"Our Bed & Breakfast is best judged not by our guests choice to stay here, but by their desire to return." Looking for comfort, relaxation, and adventure, with a vivid sense of the local mining history? Searching for a distinctive, romantic Bed & Breakfast? 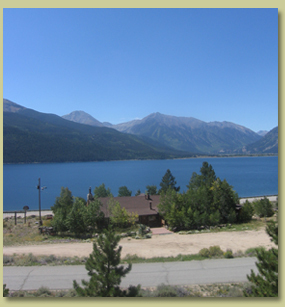 One that offers unparalleled view of Colorado's tallest mountain, Mt. Elbert (14,431'), refected in the clear waters of Colorado's largest glacial lake? Then, look no more. Welcome! to Ores and Mine Bed and Breakfast. We offer a rustic setting with a decor reminiscent of the early 1900's mining era, providing the comforts of modern day. Ores & Mine features four bedrooms, each named after a well-known gold or silver mine in the area. All rooms have a private bath and a full, hot breakfast is served each morning. With the many activities available here and in the surrounding area, your stay at Ores & Mine can be as relaxing or as adventurous as your mood requires. For information on room availability or any questions, please call us at (719) 486-3552, 719-221-0350 or send email to oresandmine@gmail.com. Ores & Mine Bed and Breakfast © 2014 All Rights Reserved. Ores & Mine is a Registered Trademark of Ores & Mine Bed and Breakfast.